Danny Cartwright and Spencer Craig never should have met. One evening, Danny, an East End cockney who works as a garage mechanic, takes his fianceA© up to the West End to celebrate their engagement. He crosses the path of Spencer Craig, a West End barrister posed to be the youngest Queen's Counsel of his generation. Thus begins Jeffrey Archer's poignant novel of deception, hatred and vengeance, in which only one of them can finally triumph while the other will spend the rest of his days in jail. But which one will triumph? This suspenseful novel takes the listener through so many twists and turns that no one will guess the ending, even the most ardent of Archer's many, many fans. There are many who say that author Jeffrey Archer's life would make the subject of an excellent book. London born Archer, grew up in Somerset, whose father was a printer by trade, was educated in Wellington School and at Brasenose College, Oxford. He was a very accomplished athlete, becoming President of the University Athletics Club. That was the beginning of his elected positions in various political positions. After a bad investment left him on the verge of bankruptcy, he decided to try writing a novel to repay his debts to creditors. For his first writing attempt, Archer had great success with "Not a Penny More, Not a Penny Less". The book sold to 17 countries and became a successful serial for BBC Radio 4, then televised in 1990. His second novel, "Shall We Tell the President", was a thriller about a plot to assassinate Edward Kennedy as though he became President. Several novels followed, each more successful than the others. He also mixed in some non-fiction and collections of short stories as well. Archer is also a playwright with his first play being run at the Queen's Theatre in London's West End in 1987 for over 600 performances. He had a few plays that were quite successful, having played an acting role in one of the last to be performed. In November of 1999, Archer was charged with perjury and conspiracy to pervert the course of justice, for which he served two years of a four-year sentence. He used that time to write a volume of documentaries about his experiences in the prison system. They were entitled.......Prison Diary: Volume I, Hell.......Volume II, Purgatory.........and, Volume III, Heaven. Archer is now published in 97 countries and more than 37 languages.......he is firmly established as an author of note. He has been married for 49 years to Dame Mary Archer DBE, and they have two sons and two grandsons. Their time is divided among their three homes in London, Cambridge, and Mallorca. I read a lot of books and enjoy all kinds of fiction. 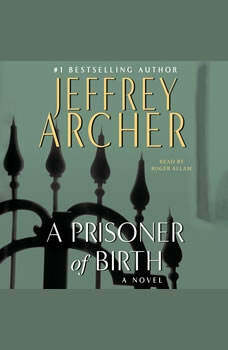 A Prisoner Of Birth has to be one of the best I've ever read. Archer make the characters come alive for the reader. I couldn't put it down for the last fourth of the book because I needed to find out how it ended. Don't hesitate to get this book and read it, there is no doubt in my mind that anyone who reads it will enjoy it. I tried this book as something different. This turned out to be a book I could not put down. It's got a great story, great writing, and a great ending. It's a book you don't want to miss. Best I've read in a long time.